ZURICH (Reuters) - Former world No. 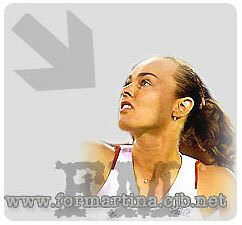 1 Martina Hingis says she may never play professional tennis again. The 22-year-old decided to take a break from the game in October because of a lingering foot injury and disappointing results since she returned to competitive action last August. She was expected to participate in the Australian Open but raised doubts about her future in the sport when she withdrew from the event in December. "It is totally possible that I won't play top tennis again, because my feet will not allow it," Hingis was quoted as saying in the Blick newspaper. While the top players battle it out at the Australian Open, Hingis says she is happy to take it easy at home, improving her English, and her desire to compete again is waning by the day. She said she enjoyed the lack of stress and competitive drive in her life and did not miss playing at the first grand slam of the season in Melbourne, which she won in 1997, 1998 and 1999. "I'm not bored. I've spent the last two months doing lots of sport -- skiing, riding, long walks in the wood with my dog. "And I'm now going to school -- I'm trying to perfect my English. And also finally I now have more time for my private life." Hingis, who dominated the women's game in the late 1990s, had surgery on her ankle last May when two ligaments were replaced and never recovered her best form. Her tactical game has also been rendered obsolete by the powerful Williams sisters. "Health-wise I cannot complain and my foot, feet are OK if I don't force it when I'm playing tennis. "But as soon as I try to train competitively, the pain starts." No longer world No. 1 -- that is Serena Williams -- Hingis is now No. 2 in Switzerland behind Patty Schnyder. "It was never my goal to be number one in Switzerland, I wanted to be world number one. And I was for four years. "I have survived no longer being world number one and I will survive being Swiss number one no longer. And I just don't want to think about a comeback."